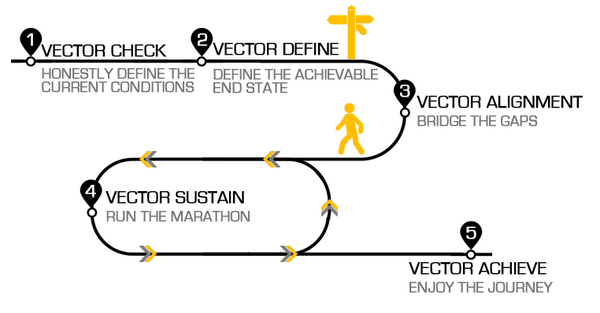 The Vector Method is a powerful, holistic process that equips individuals and organizations with the ability to move from where they are to where they want to be. It enables you to align and sustain your vector and ultimately achieve your End State. The method consists of five phases and each phase utilizes the Vector Group’s unique content and specialized process. This is where you face the mirror and honestly define the current conditions. In this phase, we help you clearly identify where you are located. This provides the foundation and starting point. The second part of Phase One is identifying the current vector. Where are you headed? Where is your organization headed? What is the plan? This establishes your current vector. Phase Two is what we call The Crucible, this is where we work with you to burn off all the fluff and distractions in order to define True North and the achievable End State. Dream big. What are you passionate about? What do you want to achieve? What kind of legacy do you want to leave? What do you want your organization to be known for? Take time to reflect on what you believe and value and how that impacts your life. Our job is to challenge your through the process and burn off the things that don’t line up. It is all about making course corrections and bridging the gaps between the current vector and your true vector. Phase One and Two are challenging but they don’t require much immediate change. Phase Three, Vector Alignment, is about change and adjustment. There will be resistance internally and externally. Do you or your organization have the willingness to change? There has to be a willingness to change and then commit to the changes if you want to achieve your goals. Maintain the course. It’s a marathon and we all encounter challenges and obstacles along the way. The key is to embrace grit and never give up. Life is full of challenges and obstacles. Our goal is to prepare you to deal with the challenges and equip you to turn the obstacles into opportunities. In this phase, you identify the obstacles you will face and chart a course to avoid Swamps, Chasms, Dark Forests and Desert and achieve your End State. Maintaining an intentional vector is a process and requires inspiration and motivation. We partner with you to cultivate the internal drive or organizational culture needed to achieve your goals. During the victory lap, we reflect on the journey and take the time to celebrate the achievement. There is an art to celebrating well and it is important to learn how to obtain healthy satisfaction from our achievements. Taking a victory lap is about acknowledging the effort and sacrifices made in order to achieve the goal. It also allows for an opportunity to reflect on the journey. Think about the good and the difficult. Learn from it and apply the lessons to continuously grow. So, where to next? What is the next goal? Is there another challenge to tackle? Never stop growing and improving! Contact us to discuss which program is best for you to reach your peak performance objective.